Matthew Lansdown has hooked the conversion to the left of the posts. Samisoni Taukei'aho sets up the try. The pressure has finally told as Tawera Kerr-Barlow scores from close range. Peter Samu has made 10 good tackles so far this game. This is dangerous for the defence as Mitchell Jacobson bursts through to advance the Waikato attack. Ethan Blackadder has made 10 good tackles so far this game. Waikato have won 80 rucks so far this game. Shannon Frizell has made 10 good tackles so far this game. Matthew Lansdown curls the ball too far, missing the posts to the right. Sam Christie sets up the try. A gap opened in the defence and Zac Guildford took full advantage. Silky skills by Waikato ends with a try for Zac Guildford. Where did Tima Faingaanuku come from??? It looked for all the world that a try was going to be scored but Tima Faingaanuku makes the tackle. Surely there's going to be a try here - but no!!! Ethan Blackadder saves the day with a real try saver of a tackle. Waikato have won 60 rucks so far this game. Tasman decide to make a substitution, with Pari Pari Parkinson getting some game time. Tasman decide to make a substitution, with Vernon Fredericks being replaced. The touch judges raise their flags as Matthew Lansdown kicks the conversion. The Waikato pack has powered over for Samisoni Taukei'aho to score the try. James Lowe (Tasman) is shown a yellow card. Tasman make a substitution with Levi Aumua coming on. Tasman make a substitution with David Kaetau Havili coming off. Waikato sub Leva Fifita comes onto the field. James Tucker departs for Waikato. Duke Nginingini comes on for Waikato. Sosefo Kautai leaves the field. Mitchell Jacobson has made 10 good tackles so far this game. The defensive line has been broken as David Kaetau Havili goes through the gap. Tasman decide to make a substitution, with Finlay Christie getting some game time. Tasman decide to make a substitution, with Billy Guyton being replaced. Waikato have won 40 rucks so far this game. Waikato make a substitution with Samisoni Taukei'aho coming on. Waikato make a substitution with Epalahame Faiva coming off. Tasman sub Jack Straker comes onto the field. Isaac Salmon departs for Tasman. Mitch Hunt adds the two points for Tasman. Spellbinding play by Billy Guyton is finished off with a try. Tasman have won 40 rucks so far this game. Tasman are stopped just a few metres from the try line but Jordan Taufua picks up from the base of the ruck to score the try. Try saving tackle made by Sam Christie. What a run here by Jordan Taufua as he gets over the gainline!. Mitch Hunt does the business as his conversion attempt goes over. Mitch Hunt played a key part in that try. A wonderful passing move by Tasman is finished off by Will Jordan. Will Jordan makes the break as the defence re-enacts the parting of the red sea. Fabulous play by Tasman has led to Tima Faingaanuku being able to wriggle through a gap. Andrew Makalio comes on for Tasman. Ti'I Paulo leaves the field. Trouble here as Zac Guildford breaches the defence. This is dangerous for the defence as Iliesa Ratuva bursts through to advance the Waikato attack. A gap opened in the defence and Iliesa Ratuva took full advantage. Matthew Lansdown makes no mistake with that conversion attempt. Sevu Reece scores the try from close range. The defensive line has been broken as Sevu Reece goes through the gap. What a tackle there by David Kaetau Havili as he saves a certain try!. Tasman have won 20 rucks so far this game. That's a great try assist by David Kaetau Havili. What a run here by Vernon Fredericks as he gets over the gainline!. A series of passes by Tasman results in a try for Vernon Fredericks. Tasman are only a few metres out, surely they must score! And they do with Billy Guyton touching down. Jordan Taufua makes the break as the defence re-enacts the parting of the red sea. 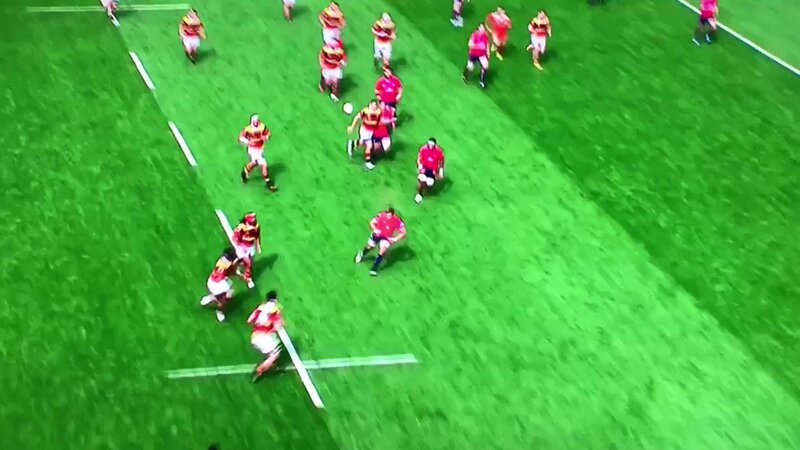 Fabulous play by Waikato has led to Sevu Reece being able to wriggle through a gap. Waikato have won 20 rucks so far this game. Sam Christie has hooked the conversion to the right of the posts. Iliesa Ratuva sets up the try. Great hands by Waikato leads to a try for Loni Uhila. Trouble here as Iliesa Ratuva breaches the defence. This is dangerous for the defence as Zac Guildford bursts through to advance the Waikato attack. The defensive line has been broken as Iliesa Ratuva goes through the gap. Last game of the season for these two teams. See you next year St George Illawarra. Halftime at the ANZ Stadium, it's simple math for the Dragons, win tonight and they make the Finals. Harbour crack the half-ton and their biggest victory ever against a clueless Auckland. Wow. RT @Mitre10Cup: REPORT + HIGHLIGHTS | @TasmanMakos survive thrilling @WaikatoRugby fightback in Hamilton. The Battle of The Bridge coming up! @TasmanMakos @Mitre10Cup She was a nail biter in the end. All the best for the rest of your season too. RT @Mitre10Cup: FT | It's a heart-stopper in Hamilton as @TasmanMakos cling on for their first win in 2017! So now the Laws of Rugby have eliminated going for an intercept. Poor decision to call Yellow Card on that!